I love this dress! You can easily wear sandals for a low key look or dress it up with heels and leather jacket for evening...Go for a darling flapper look by adding flats, pearls, and a beaded cardigan. I used a set of sheer curtains (recycling). 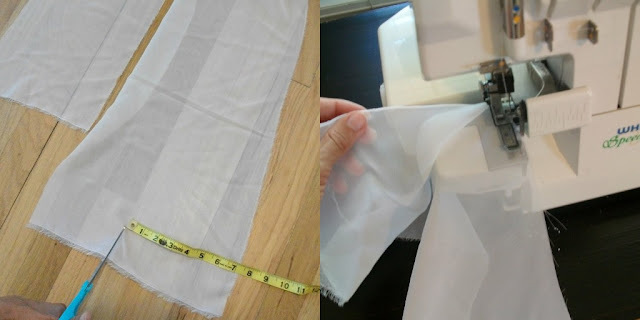 You can easily get sheer organza from the fabric store or use any fabric you like (sheer fabrics have a natural flow to them that creates a natural wave without gathering). If you don't want to finish the edges, it will have that raw look! You can find amazing slips at thrift stores for $2.00 or so. To do this you want to create even strips so cut the curtains into even sections (6 inches for mine). I also have a serger, which keeps the edges from fraying and creates the pretty curled edging. Also helps create a natural wave of ruffles. 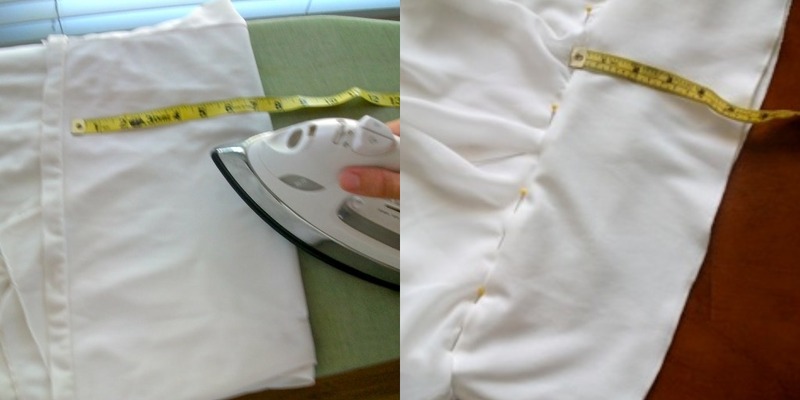 A tip to make even lines on the slip: I like to iron mine on by folding it up the correct amount of inches. Pin layers right sides together on the ironed marks: SEW every layer. Gorgeous! I just found your site via Lauren Conrad's post. Love your Carrie Bradshaw tutorial, as well as all your other creative projects. your creations are awesome and within a budget, love them! I'm sure you mean Gone With the Wind moment....thats the movie where she makes the dress from curtains- not Sound of Music. In the "Sound of Music" she is told that the curtains in her room will be replaced and she uses them to make play clothes for the children. No curtains for the children. This is in both the movies. like your window treatment...great addition to that room...I like it. Wow this is beautiful! You have made me want to look in the lingerie section of the thrift store now! And the curtain section for that matter, ha ha. I also love the necklace that you have hanging on the hanger at the top of the page. Any tutorial for that? Love this dress! So cool to deconstruct (curtains) and repurpose (flapper dress)! How clever is that! I'd totally love to wear that with a gold belt! How did you sew the top piece on? How sweety dress. Congratulation, I like it so much. You choose white and i love it. Could you give instructions on how to sew the top of the dress? Very nice...Any pattern for it? I really want to make this for my daughter. How do you sew the top piece on? Do you top stitch the layers so they stay 'down'? Also is there a way to finish off the edges without a serger? This looks great for a wedding dress! (3rd one) In a lovely satin fabric... maybe diamonties on the straps... Love it! I agree, i would love a pattern to follow step by step. I am a beginner. I would also love a step by step pattern. Love the dress. Really want to make this but I'm a beginner and a little confused about the middle steps. Great details about that . informative,interesting , motivative also which was i am looking for . please keep updating step by step . Great entry. I was looking for that. This is so beautiful! I can't get over how it flows. Great idea! Awesome!! Great idea to use sheers!! Love it!! And my family thought I was nuts using old curtains for clothes. Wonderful reuse of fabric!!! Use lists to keep your information private when playing social games. Social games, such as the many available on Facebook are gaining popularity at a rapid rate. These games require cooperation, and are not meant to be played alone. This can make progression difficult if you don't have many friends. Adding friends solely to play games with is a great way to get further in these games, but can leave your information at risk. Create a list of your gaming friends, and take advantage of the privacy settings available on Facebook to limit the access this list has to your information.